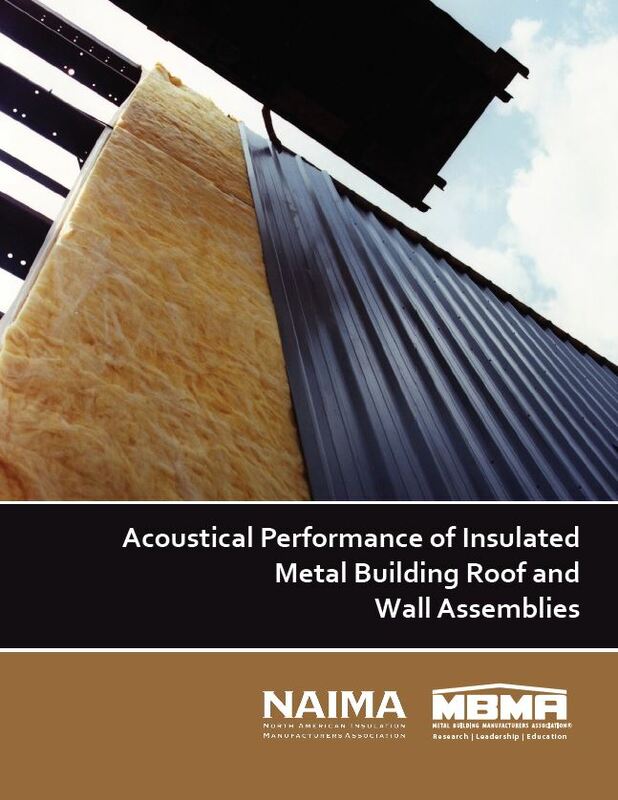 by Brianna Crandall — March 25, 2019 — The Metal Building Manufacturers Association (MBMA) and the North American Insulation Manufacturers Association (NAIMA) have just released a new guide entitled Acoustical Performance of Insulated Metal Building Roof and Wall Assemblies, available for free download from MBMA. The guide documents the ratings for sound transmission class (STC) and outdoor-indoor transmission class (OITC) on standard metal building ceiling and wall assemblies. Sound reduction is becoming increasingly important for many different types of buildings, such as schools and religious facilities. With so many new metal buildings being built, it’s important for users to understand what the noise ratings represent and how they can achieve increased performance to meet building code requirements. Acoustical Performance of Insulated Metal Building Roof and Wall Assemblies is touted as the first comprehensive guide on acoustic information for standard metal building ceiling and wall assemblies. It begins with a look into what metal building insulation consists of and how it is used, before explaining what the different terms and ratings stand for. Two single-number rating systems are used in the report: sound transmission class (STC) and outdoor-indoor transmission class (OITC). STC expresses the sound transmission loss properties of a wall or roof using common speech sounds. OITC specifies the sound transmission loss properties of exterior building elements such as walls and windows using outside noise sources such as traffic, trains and aircraft. The bulk of the guide consists of images and descriptions of each assembly along with the corresponding test results. Four common metal roof assemblies and 15 wall assemblies were tested, with STC and OITC values recorded for each assembly. Additionally, all results are tabulated on summary pages for easy comparison. The project was funded by MBMA and NAIMA with the support of the American Iron and Steel Institute (AISI). Acoustical Performance of Insulated Metal Building Roof and Wall Assemblies is available for free download from the MBMA website. The website has an array of other useful information about metal buildings and the metal building industry that is free to download, as well as additional manuals and publications for purchase. See how this new smart-tinting glass offers near-immediate relief while preserving architectural elements on a large-scale renovation July 13, 2018 In "Contract Awards"
Find out how this ANSI-approved coping system can help protect your roof from wind and water, without needing caulks or sealants May 2, 2018 In "Products and Services » Building Products"
If you need walls with both extra protection and attractiveness, check out Formica’s impact-resistant, fire-rated panels January 28, 2019 In "Products and Services » Building Products"